Public docks in DUBUQUE IOWA which are clean and new in contrast with the hillbilly shack-style construction of the SHANTYBOAT. There is a stiff wind blowing sending up gusts of spray. The scene opens with the newly recruited shipsmates standing in a regimented line in order of height. The SKIPPER looks at his shipsmates affectionately and takes the iDEVICE out of his pocket to take a photograph. SKIPPER: (To himself) I’m certainly glad I have this contraption which helps me do the job of communicating to the people who are fans of the Shantyboat. SKIPPER straightens his collar and his captain’s hat and prepares to make an Important Speech. With each “Yes, sir” the new shipsmates salute in unison. SKIPPER: This is your first day on the Shantyboat, and this is your first maneuver. As you know, running a shantyboat requires discipline! 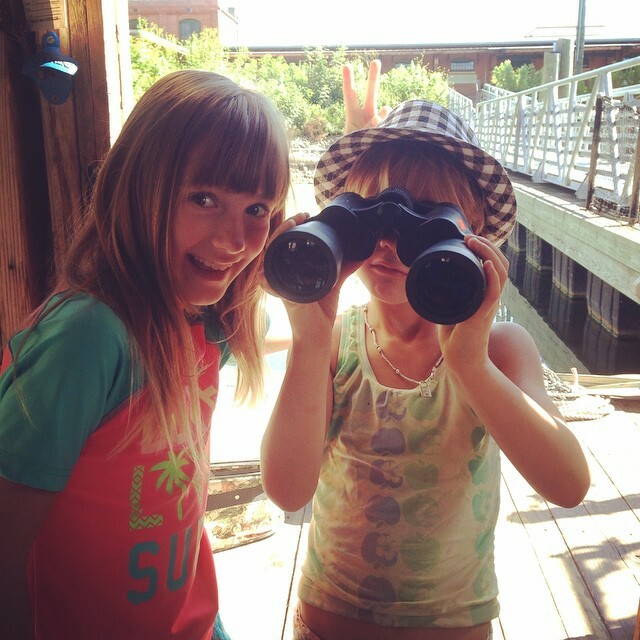 SKIPPER: Running a shantyboat requires good communication! 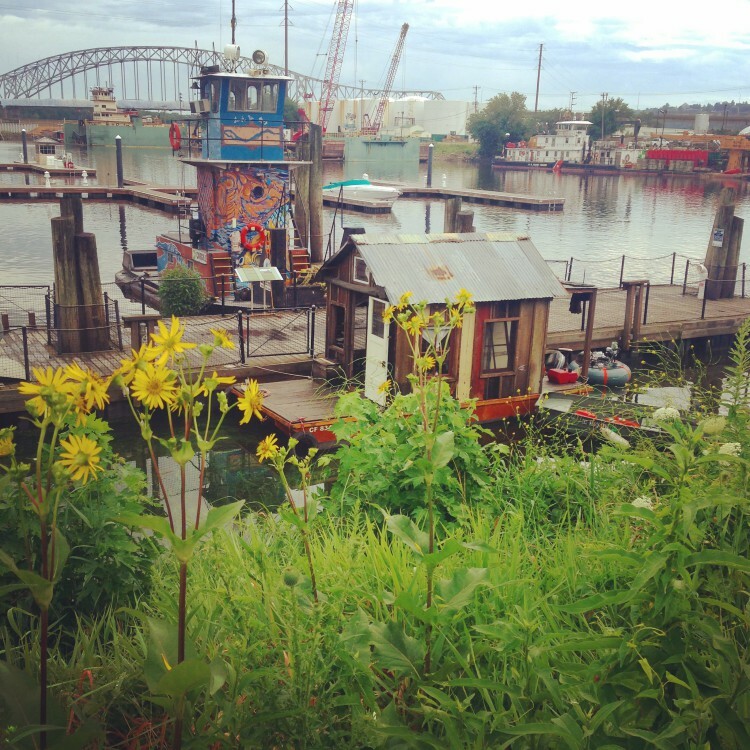 SKIPPER: Running a shantyboat requires having a Plan and sticking to it! SKIPPER: Okay, so we’ve gone over the Plan and we all know what we are going to do, right? DANNY: Cap’n, I’m on the starboard stern, ready to fend off obstacles! CRAYFISH: I’m also in back, ready to cast us off! POLLYWOG: Ay ay, sir, I’m up here, on the whatdoyoucallit, starbird bow, ready to untie the rope! SKIPPER: This will be a difficult maneuver because of the wind. We have rocks on one side and the dock on the other. It will require coordination. I’ll start the motor so we are ready to go. Okay, untie the lines, but keep ahold of the dock! CRAYFISH struggles with the hawser. SKIPPER: Crayfish, are you untied? CRAYFISH: Uhgh. I can’t get it. CRAYFISH and DANNY are working on untying the hawser. POLLYWOG: I got mine! My line is untied! POLLYWOG holds the line up in the air triumphantly. The SHANTYBOAT is blowing away from the dock toward the rocks. SKIPPER: Pollywog, are you still holding the dock? POLLYWOG: The dock? I can’t reach it! The boat is moving! SKIPPER: Arrgh! We are drifting to the rocks. I’ll grab the dock rail! The shantyboat continues to move away from the dock, but now the Skipper has his hands on the dock rail and his feet on the Shantyboat. He can’t bring it back and the gulf is widening. SKIPPER: Pollywog, pull me back! POLLYWOG grabs his outstretched hand. At that moment a gate in the dock rail swings open, swinging the Skipper out into space, but only for a moment. The entire rail, the gate, the SKIPPER, the iDEVICE, and POLLYWOG plunge straight down out of view. The SKIPPER pops up sputtering. He is wearing the gate around his neck. He looks back up at the boat, but is confused because he can’t find POLLYWOG. He looks behind him as POLLYWOG comes up frantically dogpaddling. He picks up the dripping POLLYWOG in a one enormous lunge and places her on the deck of the SHANTYBOAT. He still seems to be treading water, but then he stands up to find he is standing in water only to his chest. He wrestles the gate off of his neck and pushes the rest of the broken pieces of deck rail back up on the dock. He pulls the drifting shantyboat back to the dock and reties the hawser. SKIPPER: Wow, that was rough, but at least everyone is sa— Oh no! iDevice! SKIPPER pulls out iDEVICE from his pocket where it is dripping water from all its ports, dead, drowned, and ruined. A funeral dirge begins to play. Song: iPHONE IS DEAD / SO MANY WAYS TO FAIL.